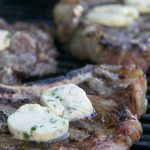 Easy recipe for Gorgonzola Herb Butter. Perfect butter spread for steak, bread and more. Add all ingredients into bowl, and mash together using a fork. Place butter mixture onto plastic wrap and shape into a log. Cover completely with the plastic wrap and roll on counter until you have a nice smooth and even log. Place in refrigerator to chill for at least one hour. Remove from wrap and cut into slices. Grill your favorite steak, grill on one side and flip steaks. Add butter and finish grilling.